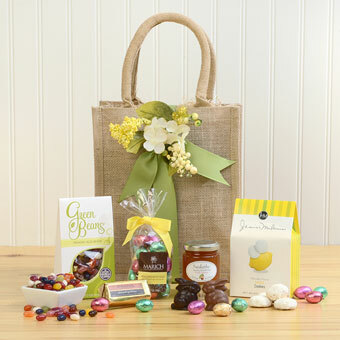 Small in size but packed with flavor, our charming jute tote features an assortment of sweet springtime nibbles! Lemon Tea cookies provide a tart, sweet bite with tea or coffee, and are delicious straight from the box. Brightly-hued all natural jelly beans provide a sweet snack any time of day, and colorful milk chocolate eggs are delightful to unwrap and savor as they slowly melt on your tongue. Chocolate lovers will wistfully remember, long after it's gone, the dense, ooey goodness of Fran's Almond Gold Bar, a combination of soft caramel and roasted almonds dipped in dark chocolate. Miniature milk and dark chocolate bunnies are almost too cute to eat, but any guilt will be gone in a flash once tasted. And the bright, sunny flavor of Sarabeth's Peach Apricot jam is the perfect complement for breakfast or tea service. With just enough mini-bites to satisfy any sweet craving, this is an ideal gift for friends, teachers, and family. Marich Confectionery - Green Bean Jelly Beans: Made with fruit juice concentrates and colored with natural fruit and vegetable extracts for a pure, delicious treat! Marich Confectionery - Foil Wrapped Milk Chocolate Easter Eggs: Premium, silky milk chocolate eggs wrapped in vibrant foils. Fran's Chocolates - Almond Gold Bar: Smooth buttery caramel and roasted almonds dipped in decadent dark chocolate. J&M Foods - Lemon Tea Cookies: Tart, citrusy cookies dusted with powdered sugar - the perfect bite for lemon lovers! Sarabeth's - Peach Apricot Jam: A springtime favorite from a blend of sweet, juicy peaches and ripe California apricots. EMVI Chocolates - Miniature Bunnies: Adorable chocolate Easter bunnies handcrafted in upstate New York from premium chocolate. GIFT TOTE: Sturdy re-usable jute tote, 9" x 11" x 4"